Q: A friend of mine is reading a book by someone who said there are four calendars we are to operate on Scripturally. Have you ever heard about this? A: Your friend is correct when he says that Judaism understands there to be four calendars (or “new years”), hence the reason the first day of the seventh month is celebrated as “Rosh HaShanah”—the “head of the year.” With all due respect to the Rabbis, however, such an idea cannot be defended from Scripture. First, while the phrase Rosh HaShanah does occur in Ezekiel 40:1, it is not in reference to the first day of the seventh month. Second, though Exodus 34:22 says that “the revolution of the year” occurs in the seventh month, the phrase is referring to the Feast of Ingathering, which falls on the fifteenth of the month, not on the first. “The revolution of the year” speaks to the circuitous nature of Israel’s agricultural schedule, the harvests of which begin in the Spring and conclude in the Fall. Then the process of planting, sowing and reaping repeats. Scripture only mentions one beginning of the year: Rosh ’Chadashiym, which means “Head of the Months” (“Months” is literally “New Moons”). Exodus 12:2 calls it “the first of the months of the year,” referring to the month in Spring known Niysan (Ne.2:1, Est.3:7) or Aviyv (Ex.13:4). So, despite the historical development of Judaism, Adonai established only one annual calendar for Israel, and it begins with the harvest and new life of Spring. What do you think? How, if at all, should this affect our observance? Other thoughts? Your insights are refreshing and inspiring and you answers always seem to shed new light on old problems. I really see no problem… It’s stated in the Torah that the month of the Aviv shall be the beginning of months. With that said… I can’t see how anyone can refute that! 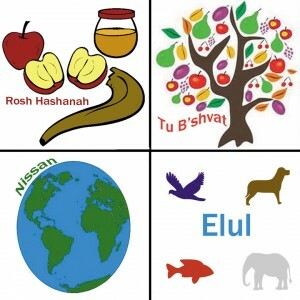 When asked, a couple of Rabbi’s in the Denver Metro area said that the beginning of the “spiritual ” calendar is the 1st day of Niysan, while the “civil” calendar begins at Rosh HaShana. I think you are correct. Torah clearly says that Niysan is the 1st month of the year. Again, the traditions of men are given priority over the Law of God; even by “observant” Jews.